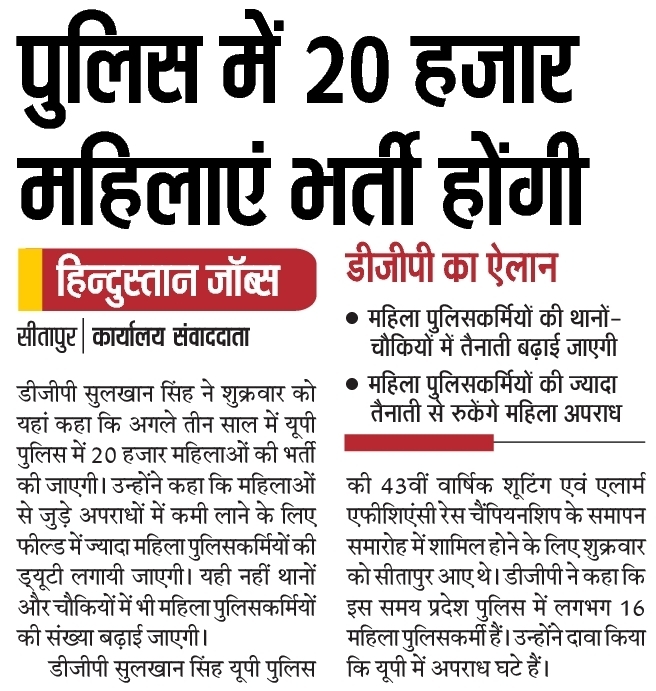 Recently A new announcement was made by D.G.P Sulkhan Singh (U.P) stated about the new recruitment that will take place soon with at least 20,000 vacancies in Uttar Pradesh Only in Police Department For female candidates. D.G.P said all vacancy will take place in upcoming 3 years. Applicants who are interested to make choice in the Police department and also want to come true their dreams, they must apply for this recruitment Notification by UP Police. 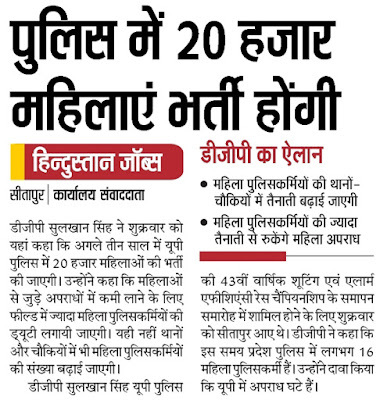 To Reduce the crime percentage, this is bold step by UP police and will ensure the safety of Women in UP. SarkariNaukriCareer Team will be keeping update on this advertisement, and if there is news, will be updated as soon as possible. Currently, there are 16 Thousand women working in UP Police Department and with this Advertisement, the There number would be increased and women will get the benefit of it. D.G.P Also claimed - Crimes has been down in UP. Women candidates who want to apply, they must be ready. Till the date, there is no advertisement so, you can download official notice when it gets updated. Payment mode is not decided yet and complete information will be updated in official advertisement. Applicants must be gone through the Physical Test and also then For Written exam as per the tentative information and will be verified when the UP Police Female advertisement would update the information. It is expected the Application Form For UP Police female Bharti will be online. You can directly Apply From Official Website of UP Police Bharti Department. Kindly Subscribe us by Entering your email and also don't forget to activate the link in the email you received. Also, you can bookmark this page by CTRL+D.